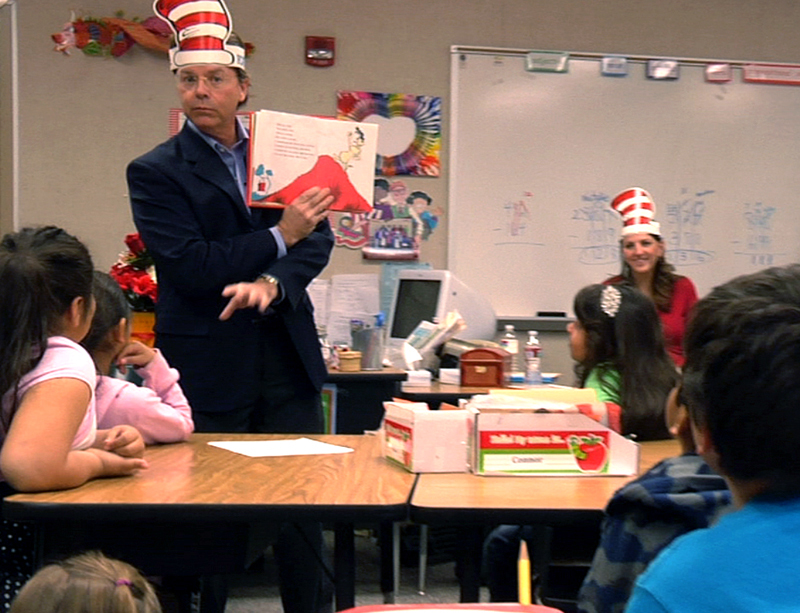 Celebrating Dr. Seuss’ birthday and Read Across America Day, Santa Clarita Valley schools welcomed guest speakers to share their love of reading with students Friday. The nation’s largest reading celebration was kicked off at Fair Oaks Community School with an assembly where sixth-grader Maddie Rafter was awarded the inaugural Dr. Suess Reading Award, which came with a $100 Barnes & Noble gift card, courtesy of Kohls. More than 460 Fair Oaks students met their accelerated reading goals last semester, Principal Marie Stump said. Local residents and SCVTV staffers Dave Caldwell, who’s the station’s sports director, production specialist Austin Dave and Production Manager Megan Perez also read their favorite Dr. Seuss books to a group of first- and second-graders. In the last three years, Maddie has earned more than 600 accelerated reader (AR) points, totaling more than 6 million words. Teacher Ken Newton said he and the librarian have lost count of how many books Maddie has read. During his lifetime, Dr. Seuss published more than 60 children’s books. Friday would have been the author’s 109th birthday. He died Sept. 24, 1991.